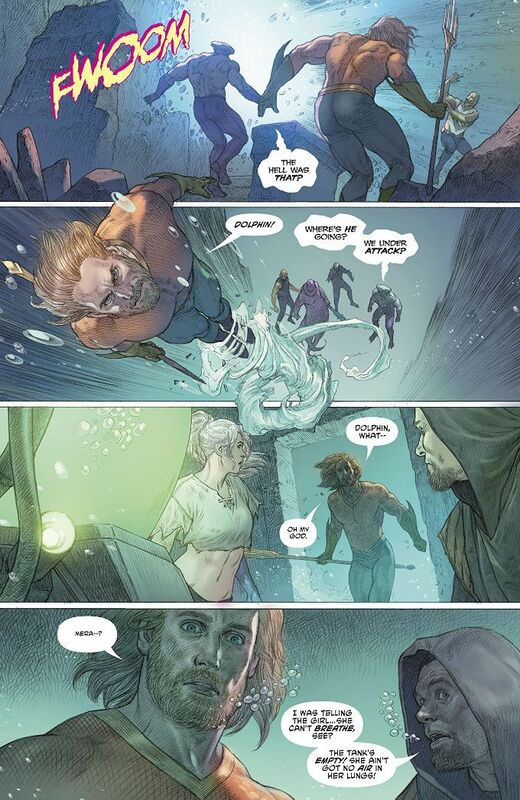 Aquaman has found his lost love, Mera, but the magical curse shielding Atlantis will kill her unless she is returned to the surface immediately. Thankfully, he'll find some unexpected aid from the mystic order known as The Widowhood, but they have their own agenda for helping him... and it involves putting Mera on the throne of Atlantis in place of the usurper King Rath! There are several aspects of Dan Abnett's story I want to take issue with. The chief one is the idea of the people of Atlantis suddenly rallying behind the banner of Queen Mera, when her status as a native of Xebel (a prison plane the ancient Atlanteans used for holding certain undesirables) when such a big deal was made about the people never accepting her as a ruler in previous issues. Granting that circumstances have changed, it still seems a bit sudden. I'm also not overly fond how the sudden love triangle that seems to be forming between Mera, Dolphin and Aquaman, merely because it makes Dolphin suffer as a character and the whole thing seems derivative of the Tinkerbell/Wendy/Peter Pan relationship... even ignoring Dolphin's muteness and light powers. Still, Abnett makes the action of the story engaging outside of those points and the drama here a Mera agrees to sacrifice the live she wants for the sake of seeing Rath defeated is true to the character and truly touching. The artwork by Riccardo Federici and Sunny Gho captures the script perfectly and looks fantastic throughout. The Final Analysis: 8/10. I my not like parts of this story but it is still well-told.